In northern climates, architectural elements—such as cantilevered beams, concrete balconies, roof penetrations, parapets and canopies, spandrel glass, and other ornamental features often are limited due to compliance with local energy codes. Executing these design elements can create thermal bridges that extend beyond the insulation systems within the building envelope. The resulting temperature differences can cause condensation buildup in exterior systems, in addition to significant loss of energy performance for the whole building. Both issues can hamper efforts at designing and constructing buildings to meet the owner’s expectations while meeting energy codes—or pursuing green building rating programs. Thermal bridging can have a very large impact from a cost and compliance standpoint. Heat flows determine the building’s heating and cooling system capacity, long-term energy costs, and compliance with energy codes, and energy performance ‘overlay’ programs like Leadership in Energy and Environmental Design (LEED) Canada. How building materials are arranged in the envelope determines the surface temperatures, moisture development, long-term durability, and the potential for mould growth within outward facing building systems. Much has been done in recent decades to address inaccuracies in HVAC sizing because previous generations of energy modelling did not account for interface details, which can have a significant impact on the overall wall area. More accurate thermal performance measurements will have to include typical envelope details such as wall/wall (corners), wall/roof, wall/floor, wall/door, and wall/window connections. This is in addition to measuring the thermal performance of the ‘clear wall’ area, insulation layers, and the structural elements. Due to new product releases and newly available baseline energy performance data (“Studies in Thermal Bridging,” page 4), construction details are now available for insulating steel and concrete penetrations. These types of enhancements can give project teams new freedom for creative design, including designs for net-zero energy buildings that can also address condensation resistance and energy efficiency of the building envelope. 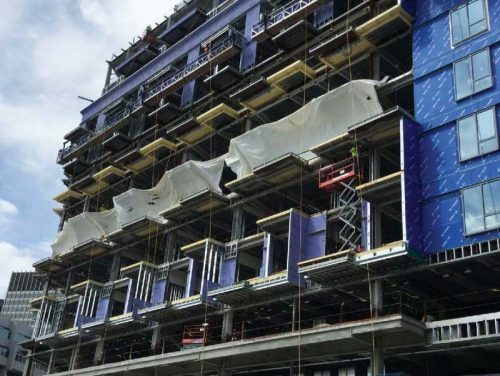 Fluid-applied insulated coatings can assist project teams with condensation reduction and whole building energy efficiency when applied to structural building elements—or thermal bridges—bypassing the insulated portions of the building envelope. 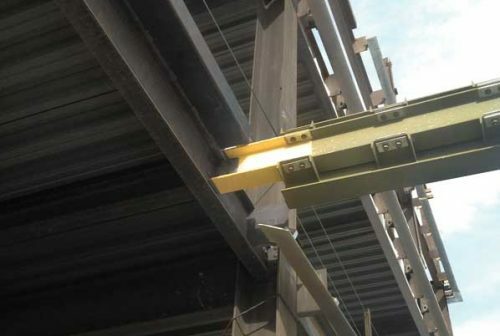 Essentially, the acrylic insulation coatings stop the process of heat convection via a steel beam; these coatings have been infused with insulating fillers in order to produce a low-conductivity material that can be applied while in its fluid form. Fillers can be ceramic or glass spheres, which can provide thermal conductivity in the 70 to 100 mW/mK range. Newer fillers, such as aerogel particles, can offer a thermal conductivity as low as 35 mW/mK. Fluid-applied thermal break coatings (the yellow elements in the above image) are employed on common areas of thermal bridging concern, such as structural steel where external temperatures can transfer into the building envelope. According to Greg Pope, co-author of Aerogel Fluid Applied Coatings Solution for Thermal Bridging for Design Community, interest for architectural use grew quickly after the thermal performance test results were discovered. To put this in context, this allows a human hand to touch for 10 seconds a 150-C (300-F) metal pipe that has been insulated with a fluid-applied thermal break coating without any burn to the skin of his hand. The aerogel-infused coating will insulate the pipe, lowering the surface temperature of the coating to approximately 38 C (100 F). Thanks for sharing this, excellent article. Definitely forwarding this PDF to my colleagues as well.